We love market shopping in Edinburgh! With lots of different city markets to choose from, we've picked out some of the best. Today we are looking at our favourite Edinburgh markets for tasty, fresh food, pretty arts and crafts and unique gifts. So you can have fun exploring them during your next stay with us in Edinburgh. The Edinburgh Farmers' Market is on Castle Terrace every Saturday between 9 am and 2 pm. In its stunning location at the foot of Edinburgh Castle, this is an award-winning market with over 50 specialist stalls. If you're lucky enough to be in Edinburgh on the first Saturday of the month, you can enjoy the slow cooking demonstration that is held then too. These three markets are run by the same organisers every weekend in Edinburgh. On Saturdays, choose from The Grassmarket Market in the Old Town, and Leith Farmer's Market in Leith, a short bus ride from the city centre. Both are open 10 am to 5 pm. Head to the Grassmarket for arts, crafts and tasty treats. Or, visit Leith for fresh, local fish, meat, vegetables, cheeses, baked goods and more. And every Sunday, the gorgeous Stockbridge Market is on 10 am to 5 pm. You'll find a range of Edinburgh traders selling the best local produce. Stockbridge is an easy and picturesque stroll from the centre of the city and has a wealth of wonderful independent cafes, restaurants and shops to visit as well. The Festival Fringe holds arts and crafts markets on the Royal Mile and the Mound Precinct throughout August. These summer markets are the perfect way to soak up the atmosphere of the world's biggest arts festival. With handmade gifts, drawings and paintings, jewellery and accessories, there's something for everyone here. And you might catch a festival street performance or show while you're there too! Perhaps the most famous Edinburgh market, although it is only on over the festive season. You can't miss this bustling, sparkling Christmas Market in Princes Street Gardens from mid November to early January, which attracts visitors from all over the world. Here you can browse unique Christmas gifts and sample delicious festive food and drink. There's nothing like a hot chocolate or mulled wine to warm you up on a cold winter's shopping trip. 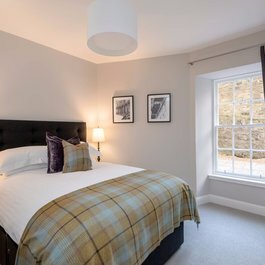 If you're looking for a self-catering holiday apartment for your shopping trip to the Edinburgh markets, look no further! At Lets Get Local we have a wide range of city centre accommodation to choose from. 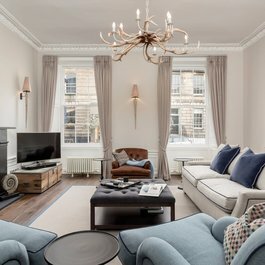 Please take a look and contact us if we can help you to find your perfect holiday home in Edinburgh.